And/or whose work as an ally helped to support inclusion, collaboration, and capacity-building with American Muslim communities. Eligible individuals have demonstrated courageous leadership working for the inclusion of American Muslims. Raising understanding and awareness of American Muslim community rights and concerns: Significantly advanced greater understanding and awareness of American Muslim community rights, issues, needs, and concerns in ways that reduce discrimination and promote mutual respect and inclusion. 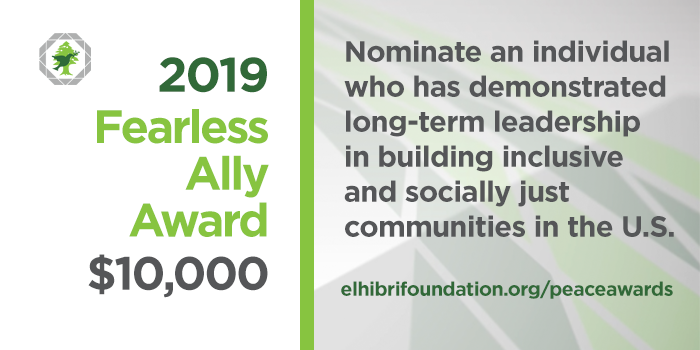 The Fearless Ally Award is awarded based on a ranking of criteria from nominations received through the online form during the open application period. Members of the Fearless Ally Award Selection Committee include experts in American Muslim community organizing and community building. The selection process may include interviews with references familiar with the nominee’s unique contributions to building partnerships and collaborative communities. Individuals may nominate themselves or others for this award.